There are several very interesting presentations this week that are well worth attending. 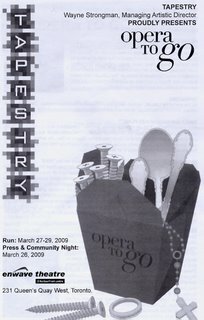 First of all, I can recommend Tapestry Newopera Work's presentation of Opera To Go, an evening of four newly commissioned short operas. I attended the opening last evening, and can honestly say that I was hugely impressed by the wealth of talent and creativity that exists in Canada. Under the leadership of Managing Artistic Director Wayne Strongman, Tapestry actively nurtures composers and librettists by holding intensive summer workshops, known as LibLabs. Over the past 14 years, 47 composers and 47 librettists have participated. So far over twenty 15-minute opera works have been created and staged by the Company. In this year's showcase, three short pieces (One Lump or Two? / My Mother's Ring / The Virgin Charlie ) and one 40-minute work (The Perfect Screw) are being staged. Three comedies and one dark piece, a ratio that seems to be par for the course. I find myself totally engrossed and hugely entertained by all four pieces. It is workshops like this that take opera out of its "grand" mode to a more accessible level. New works like these keep the art form alive. Performances on March 27- 29, at the Enwave Theatre in 231 Queen's Quay West, Toronto. Speaking of new works, Opera in Concert is staging Canadian composer Charles Wilson's newly revised Kamouraska. Though composed in 1974-5, this piece never received a full staging until now. According to the OIC website, this opera is based on a Canadian novel by Anne Hebert, "a tale of horror and imagination, based on a real 19th century love triangle in rural Quebec. Charles Wilson’s opera paints a terrifying tableau of the life of Elizabeth d’Aulnieres, her marriage to Antoine Tassy - squire of Kamouraska - his violent murder, and her passion for George Nelson, an American doctor" It stars former COC Ensemble member soprano Miriam Khalil, as well as James McLennan and Alexander Dobson. Alex Pauk conducts the Esprit Orchestra, with OIC Artistic Director Guillermo Silva-Marin as dramatic advisor. Performances on March 28 8 pm and March 29 at 2"30 pm at the St. Lawrence Centre for the Arts, 27 Front Street East, Toronto. Another important event this week is Madama Butterfly produced by the newly resurrected Opera Hamilton. It opens on March 31 in a "special performance", followed by two more on April 2nd and 3rd. It takes place at the Ronald V. Joyce Centre for the Performing Arts, Hamilton Place, 60 minutes drive down the QEW from Toronto. It stars Chinese soprano Ai Lan Zhu as Cio Cio San, with tenor Gordon Gietz as Pinkerton. Baritone Gaetan Laperriere is Sharpless and former COC Ensemble Studio member mezzo Lauren Segal is Suzuki. Long time OH stalwart Daniel Lipton conducts. Finally, you have one last chance to catch the Toronto Symphony Orchestra, featuring the superb pianist Louis Lortie and the sensational conductor Yannick Nezet-Seguin joining forces for a program of Ravel and Prokofiev at Roy Thomson Hall on Saturday. I attended the Wednesday performance, a truncated show with only Ravel Piano Concerto in G Major and the Prokofiev 5th Symphony. Lortie was in scintillating form, offering a sparkling account of the G Major, expertly supported by Nezet-Seguin. The mammoth No. 5 is a little too bombastic for me - too much brass and percussion in the first movement, but as a performance, it was absolutely stunning. The March 28 show is also truncated, with Piano Concert for the Left Hand replacing the G Major, and the addition of the orchestral version of Alborada del gracioso. It is also billed as a "casual concert", with an early start (7:30 pm) and a jazz ensemble to entertain the audience after the show. Any chance to hear Lortie and Nezet-Seguin is not to be missed! One of the joys of opera going is to discover new and exciting voices. Those in attendance at Tuesday's noon hour concert at the Four Seasons Centre in Toronto were treated to a delightful display of the vocal richness Canada has to offer. Current and former members of the Canadian Opera Company Ensemble Studio offered selections from Puccini's La boheme to a packed Richard Bradshaw Amphitheatre. The COC is staging this perennial favourite in a series of 12 performances starting April 17, starring a cast of nearly all Canadian talent, led by former Ensemble member Frederique Vezina (Mimi), David Pomeroy (Rodolfo), and Peter Barrett (Marcello). Often we forget that behind the "first cast" is a team of "cover artists" or understudies who are ready, willing, and able to take over in case of an indisposition. Yesterday we got to hear the cover singers showing what they can do. Without the benefit of sets, costumes and orchestra, these singers managed to bring Puccini's music to life through their voices and the force of their personalities. 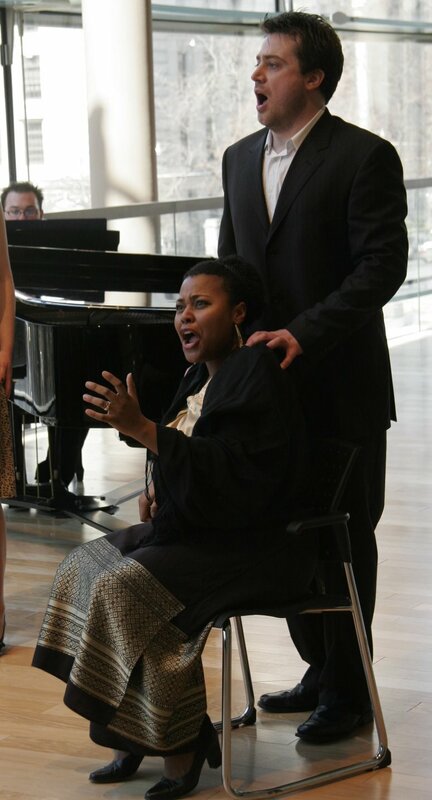 Leading the cast was soprano Yannick-Muriel Noah as Mimi. Noah made a splash last season replacing an ailing Eszter Sumegi in two performances of Tosca, receiving raves. The first prize winner of the prestigious Hans Gabor (Belvedere) Competition in Vienna two years ago, Noah was given a contract to sing the title role in La Wally last fall in Klagenfurt (Austria), receiving critical acclaim. As Mimi, her rich and dark-hued spinto was shown to advantage, her "Donde lieta" a model of delicacy and emotional power. Partnering her as Rodolfo was tenor Adam Luther, who was a youthful and impetuous Jacquino in Fidelio earlier this season. Tenors with good voices are always in demand, and when one combines voice with handsome stage presence, it is a recipe for success. As Rodolfo, Luther sang with ringing tone, only a little short on chiaroscuro. Baritone Alexander Hajek's Marcello was engaging and stylishly sung. Former Ensemble member Peter McGillivray nearly stole the show as a lively and big-voiced Schaunard. Bass Michael Uloth took full advantage of Colline's brief moment to shine in "Vecchia zimarra" The trio of Musettas - sopranos Laura Albino (Act 2), Lisa DiMaria (Act 3)and Teiya Kasahara (Act 4) all brought their unique gifts to the role. Albino sang a sassy "Quando m'en vo"; DiMaria made a vivid impression in her exchanges with Marcello, and Kasahara was suitably sympathetic and compassionate in Mimi's final moments. Ensemble Studio conductor Samuel Tak-Ho Tam offered full support to the singers, as did collaborative pianist Christopher Mokrzewski. With twelve performances scheduled - a huge number and two more than usual given the popularity of Boheme - I wouldn't be surprised if some of these singers will get their moment in the sun. The second Parisian opening night is at the historic Opéra-Comique. I mounted the metro exit stairs at Auber (a station named for the composer) and arrived in the center of a busy traffic circle. turning around, you get the full effect of the grandiloquent facade of the Paris Opera's old house, the Palais Garnier, recently clean, dominating the square and glowing brilliantly in the night. To get to the Comique, however, you turn left after the stairs and head up Boulevard des Capucines. To my surprise, this very night, I noted a plaque high on a doorway at the building at the corner. Jacques Offenbach died in that building. How many times I have walked this route and never seen that sign. After two blocks, the name changes to Boulevard des Italians. This is not the Champs-Elysees and you pass chain restaurants and movie houses. But after six blocks you turn right on Rue Favart and the building entrance is 100 meters or so down the street, facing its own small plaza. The historic Comique, also called the Salle Favart, saw many first performances: Bizet's Carmen, Debussy's Pelléas et Mélisande and Berlioz's The Damnation of Faust to name only a few. The latest in a series of theatres on that spot, the current one is from 1898 and seats 1200. It was recently refurbished and given a modest budget by the state after being used for popular events for several years. It has now directed its focus to the baroque and the new interest in French opera - something the post-War French completely neglected. This season, for example, includes Hérold's Zampa and Auber's Fra Diavolo with Rameau's Zoroastre next month, Chabrier's Le Roi Malgré Lui from Lyon in April and the Carmen in June will be conducted by John Eliot Gardiner. The finest Parisian opera production so far this season was the December production by Deborah Warner of Purcell's Dido and Aeneas with Bill Christie and his Les Arts Florissants at their elegiac best. But there are newer operas on the schedule too, including the most recent opera by Peter Eotvos, Lady Sarashina and the opera tonight, Benjamin Britten's 1947 opera, Albert Herring. Did you ever wish that the evening you are witnessing could be recorded? It was that kind of a night. It is a rarely produced opera and you know that it will not likely ever be as well done - a cast of honored veterans of the English operatic stage, a spot-on staging and an environment where the music could bloom at its best. Deliciously tart and witty, this comedy originally starred Benjamin Britten's lifetime companion, the tenor Peter Pears. The story centers on a Suffolk small town and their search for a virtuous May Queen. The town leaders go through the list of eligible young women, finding fault with all of them; in the contemporary updating, tapes from the omnipresent UK security cameras document the misbehavior. They decide, as a critique of the wayward girls, to name a reclusive young man, a store clerk named Albert Herring, as the May King. The wide-eyed young man, the flawless tenor Allan Clayton, works at a convenience store owned by his mother. In the smart staging of Richard Brunel, the store front is glass and steel with all the fruits and vegetables wrapped in plastic. Herring learns of the dubious honor he has received when the town leaders show up at the store. The mother is entranced with the small prize money but Herring is confused. The American soprano Nancy Gustafson was elegant is the imperious Lady Billows but her mushy pronunciation had me reading the French translation more than once. There were no problems like that with the brilliant mezzo Felicity Palmer as her assistant, Florence Pike. Andrew Greenan was the blustery police commissioner with the fine tenor Simeon Esper as an ever-smiling mayor. Soprano Ailish Tynan, as the moral Miss Wordsworth, and baritone Christopher Purves, the eternally upbeat vicar, completed the town leadership. Hanna Shaer was the overbearing mother and played that with a dry intensity that was chilling. Baritone Leigh Melrose and mezzo Julia Riley were splendid as Sid and Nancy, a randy young couple who tempt Albert to break out of his shell. The smart and deliciously good-humored music was unexpected from the composer. Such fun was hardly anticipated from a composer who shows his petulant side in the collection of his letters recently published. Assisting in this special night at the opera were conductor Laurence Equilbey whose best-selling recordings with her chorus, Accentus, have made her a bright new star in France. Conducting a score of members of the orchestra of the Opera of Rouen Haute-Normandie, where this opera is a co-production, her reading of the score of this exceptional ensemble opera was warm and exuberant and could have not been more musically focused. While all operas at the Comique are not so flawlessly executed, witnessing opera in that house is not to be missed those attached to the lyric arts. Its intimate atmosphere is a perfect place to enjoy opera. Along with the operas they stage they also have concerts, lectures and events for young people illuminating the the work, the composer and his time. The website, in French, is http://www.opera-comique.com.